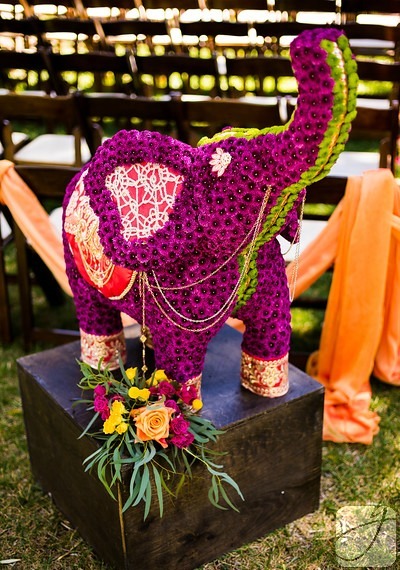 Neil and Ankita's wedding took place at one of our favorite venues ever- the beautiful Hummingbird Nest Ranch. 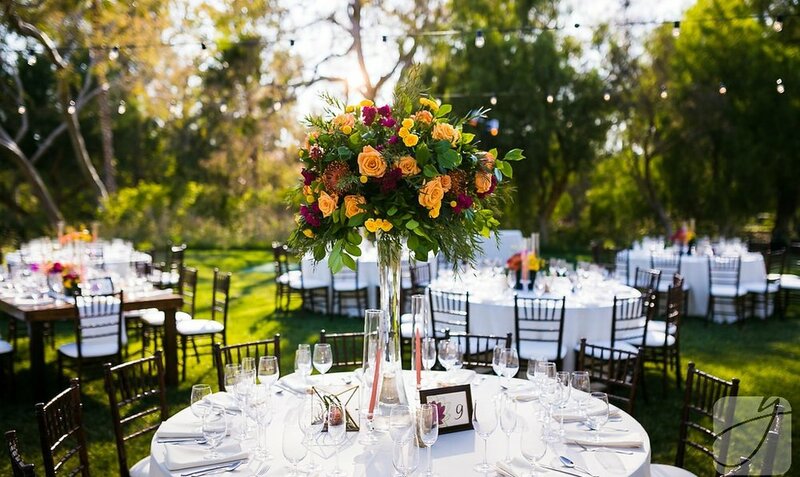 Located in the Santa Susanna Mountains, just north of Los Angeles, CA, this venue always brings out the best in our designs! The ceremony featured a vibrant color scheme with deep, dark wooden undertones. The olive trees on the Lake Lawn here were illuminated with sunlight and casted a lovely shade over the entire ceremony- trees are wonderful in an outdoor venue as they shielded the guests from some of the wonderful Southern California heat we deal with. Thank you to Mili Shah of Planning Elegance for all of her hard work in coordinating this wedding! It was a beauty! 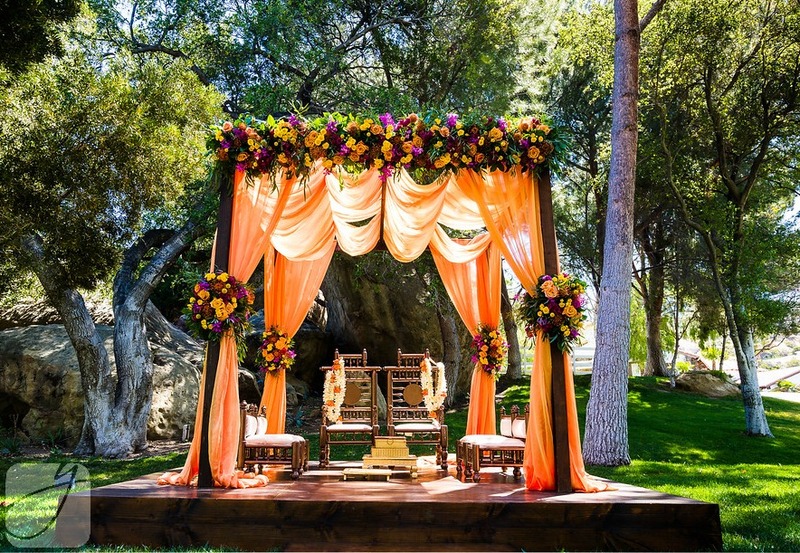 Neil and Ankita were married underneath one of our custom wooden canopy structures with draped orange chiffon. Clusters of florals tied back the draping at each post in addition to one large design that sat perched above the couple. Two of our beautiful Ellies flanked the entrance to the aisle. They featured vibrant fuchsia and green mums with ornately adorned fabric and jeweled accents. A coordinating floral cluster sat perched beautifully at the base. 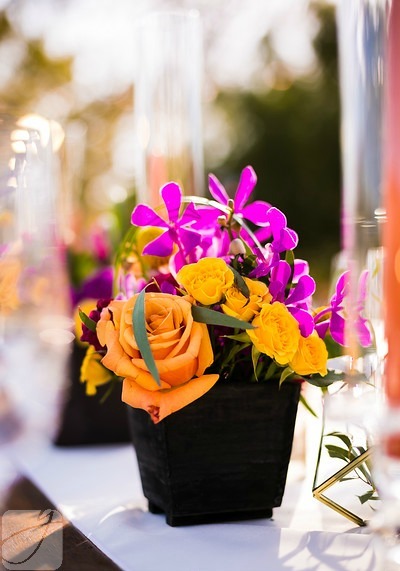 Florals featured an eclectic mix of colors with bright fuchsias, deep oranges, and vibrant yellows. Clusters of spray roses sat next to blooming orchids and more roses- and we can't forget those beautiful orange pin cushions! Sprigs of greenery kept things very organic and whimsical. The outdoor reception took advantage of the sunny, clear day. Tall centerpieces sat atop clear vases and had a crescent shape. 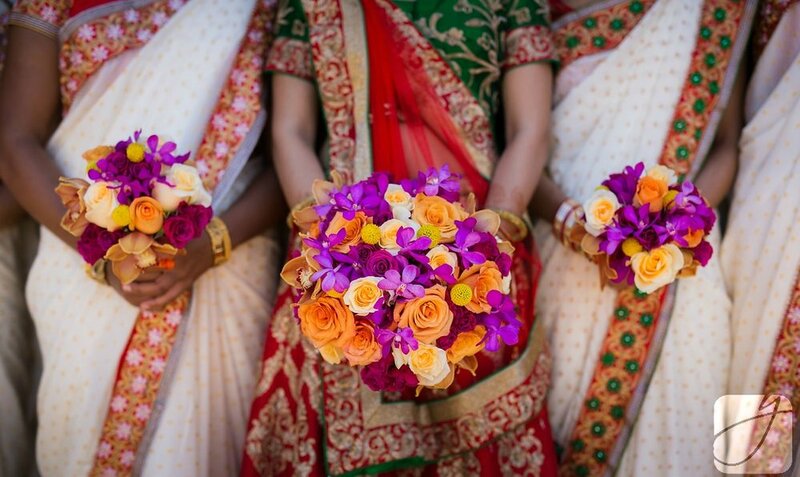 The color scheme matched the ceremony wonderfully. We had a great time bringing in some color to our candle inventory- these orange tapers were a total hit! Side note: this color scheme is just too beautiful! The real fun came in the form of our custom "life size" game of Jenga! Guests of all ages had a wonderful time playing with it! Thank you to all of the amazing vendors that made this event as special as it was!